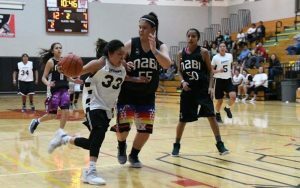 FLAGSTAFF – JJ Nakai misses her days playing electrifying basketball on the reservation. Although statistics are difficult to calculate because tribal lands are sovereign, Native Americans struggle to attain higher education. In 2017, the Postsecondary National Policy Institute, a nonprofit funded by Bill and Melinda Gates, compiled several studies on higher education, finding that only 10 percent of Native Americans earn bachelor’s degrees. During her childhood, Jacqulynn “JJ” Nakai, 18, spent the beginning of each week in Flagstaff, attending Coconino High School. Then, as if she was living two lives, she would leave the quiet forest community and drive more than two hours to a land of dry, dirt roads and quaint clusters of mobile homes and houses built of logs and clay, called hooghans or hogans. It was the Navajo Reservation, where she took care of her grandparents. “It’s so much different there. It’s so wide open, and you just do whatever you want. You do everything your own way,” said Nakai, sitting at a table in the quiet clubhouse of the Timberline Place apartment complex, where her aunt, Ernestine Thomas, lives. If the reservation was her second home, the clubhouse was her third. Down the hall from the table is a full-length basketball court, in pristine condition. 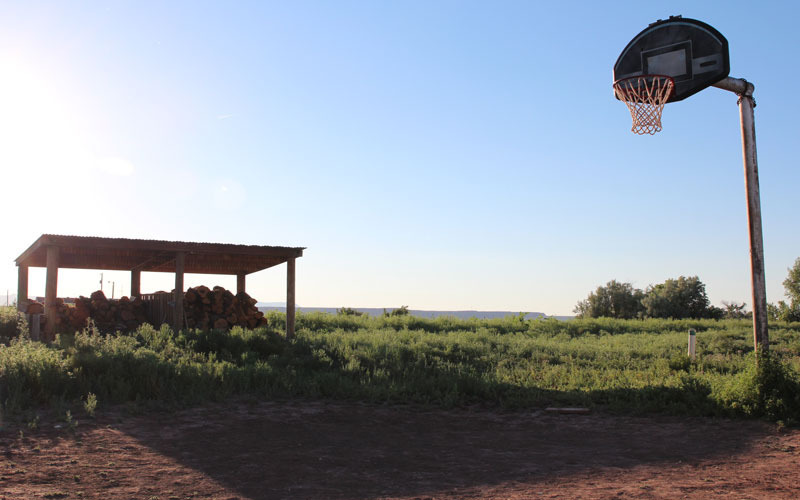 Unused and open 24 hours a day, the quiet court became Nakai’s basketball laboratory, a place to master her right-handed floater and quick-trigger 3-point stroke. It was stark contrast from the crowded gyms on the reservation. Along with her 5-foot-6 frame, Nakai carries the essence of a point guard. Her soft face is unbothered, impervious to chaos. Her dark brown eyes show a relentless drive, uninterested in easily attainable goals and completely obsessed with her true love: basketball. That wasn’t always Nakai’s path. While sports have always been in her life, her mom, Jessica Spencer-Nakai, an avid softball player, always wanted her daughter to follow in her footsteps. For a while, Nakai did, until Thomas – who apparently offered her niece more than just a fob to the clubhouse – took a then 7-year-old Nakai to watch one of Thomas’ basketball tournaments. In the little girl’s mind, angels sang. Her soul was set ablaze. Love was in the air. A member of a family of jocks – her dad and two younger brothers prefer football – Nakai stuck with softball until high school, but the hot sun and long innings became too much to bear. Basketball took over everything. Thomas became an idol to Nakai. They both loved the same sport. But as Nakai’s game improved and her goals elevated, like most athletes, she looked toward the stars for someone to relate with and be inspired by. She couldn’t find that someone. “Native Americans in general aren’t known to be successful, especially in sports,” Nakai said. Since the days of the legendary Jim Thorpe, Native American athletes succeeding at the highest levels of competition have been few and far between. Despite the widespread love of basketball among tribal communities, Shoni Schimmel, the 2014 WNBA All-Star Game MVP, is one of the few Native Americans to reach the top of professional basketball. “When I was younger, I was always looking for someone like me … whose shoes I could fill. Someone I could be like,” Nakai said. The lack of Native American athletes in the mainstream consciousness has fueled Nakai. 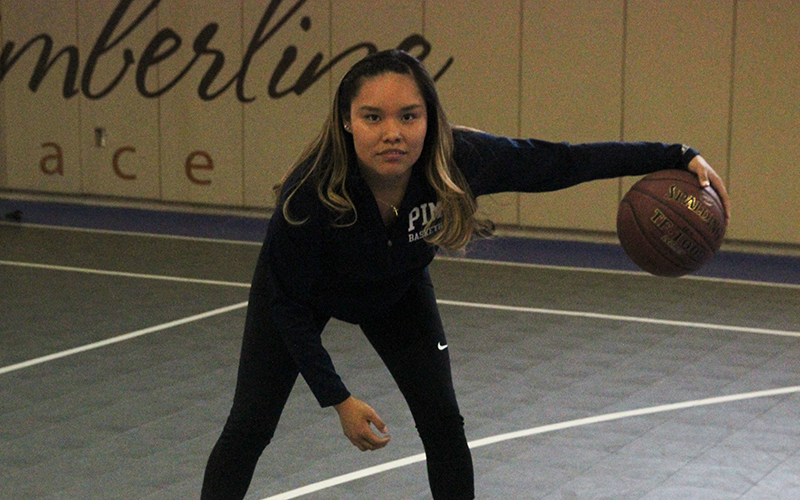 She spends more than seven hours a day running up Mount Elden, pulling a sled, lifting weights and perfecting her jump shot, thinking that maybe she could blaze the trail. “I’ve used that as motivation to be the role model for Native Americans that I was looking for,” Nakai said. 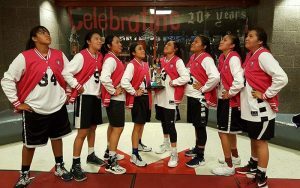 She brought what she’d learned on the reservation to the Coconino High School Panthers girls’ basketball team. She earned the role of starting point guard, and the offense was off and running. When the Panthers forced a turnover, they ran. When they rebounded a missed shot, they ran. Even when the other team scored, they ran. Nakai led the charge, zooming up the floor like a Formula One race car, meandering around defenders as if they were narrow turns on a road course. The more attention she got from defenders, the more dangerous she became. At the first sight of a double-team or trap, Nakai would whip a no-look pass behind her back to an open teammate for an easy bucket. By her senior year, Coconino was one of the top-ranked teams in Arizona. They finished the 2017 season with the best record in the conference, losing in the semifinals of the 4A state championship. Nakai did everything her senior season, averaging 20 points, 7 rebounds, 6 assists and 3 steals per game. She was named AIA’s Grand Canyon Region Player of the Year. After high school, the offers from four-year universities began to come in. One of them really piqued Nakai’s interest: the University of Alaska Anchorage, a Division II school with a well-respected women’s basketball program. Her chance to parlay her hard work into a scholarship, to blaze a trail for other Native Americans had arrived. But Nakai comes from a close-knit family, one that traveled with her and cheered her on at every tournament. She and her mother were worried that a bout with homesickness could derail her basketball career before it even started. Then, at a basketball camp in Tucson, Nakai found a school that could accommodate her needs. Todd Holthaus, the head coach of Pima CC, has spent the past decade building a winning basketball program and helping elevate his players to four-year universities. It didn’t take long for him to see that Nakai could be his next great player. A large man with a bushy, mustache-less goatee, Holthaus initially was intimidating to Nakai, but if the scholarship offer didn’t ease her mind, Holthaus’ approach to basketball certainly did. Nakai had to take a couple of weekend trips back to Flagstaff because of homesickness. But any suffering she was going through during her freshman year couldn’t be seen on the court. 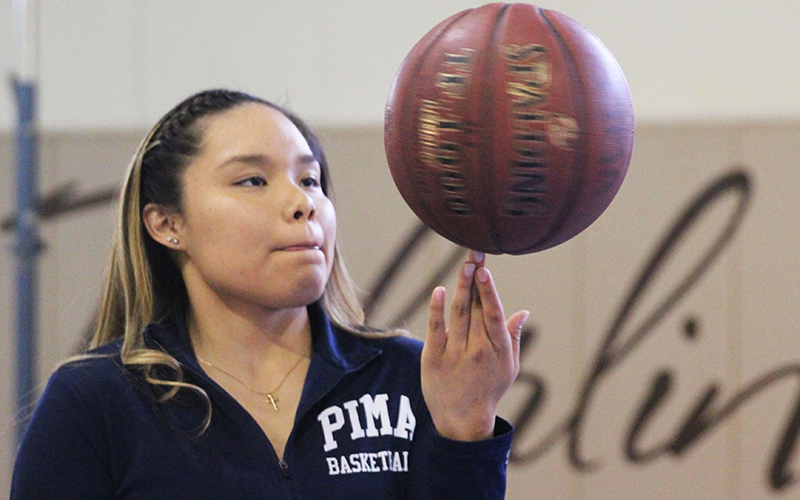 The fearless point guard led Pima CC in scoring and assists and made 40 percent of her 3-pointers. Nakai’s ability to shoot off the dribble and turn any situation into a fast break meshed perfectly with her teammates. They were even adjusted to her unexpected no-look passes. “We’ve gotten a feel for how each other plays and the no-look and behind-the-back passes are not as difficult, but we just have to be prepared for whatever she is going give to us,” teammate Shauna Bribiescas said. Nakai pushed Pima CC to a 23-9 record. She was named a National Junior College Athletic Association Division II first-team All-American and was one of 40 players selected to play in the junior college all-star game in Atlanta. As the awards came pouring in, so did offers from four-year universities. Coaches would call Holthaus, gauging Nakai’s interest. At her orders, Holthaus would keep what he heard to himself, unless the right school came calling. When the time comes, Nakai won’t be overly picky in deciding where she goes to play, but she has a goal: Arizona State University. The road to big-time college basketball is long and bumpy; Nakai and Holthaus know that. This summer, they’ll both be spending a lot of time in the gym, building her strength. Nakai understands the importance of the classroom. She’s always planned on getting a college degree, even without basketball. She wants to study sports medicine. Her love of basketball leaves little time for much else. Occasionally, Nakai enjoys lounging with friends and family, and shopping, which usually ends with her adding to her collection of basketball shoes. The Damian Lillard 4s are her newest pair. Even her dream of traveling the world comes with a caveat: playing professionally for an international team. Recently, Nakai has found a new way to spend her free time, and, of course, it involves more basketball. She gives free lessons to young Native American kids, being that role model, that shining star she searched for when she was their age.